North Korean leader Kim Jong-un blew his top against his local officials over delays in completing his promised economic projects. Other than developing nuclear arms, it has been Kim’s firm policy to push for economic progress for his country. The Korean Central News Agency reported that the plan for the plant was originally ordered in the early 1980s by Kim's late grandfather, North Korean founder Kim Il Sung. 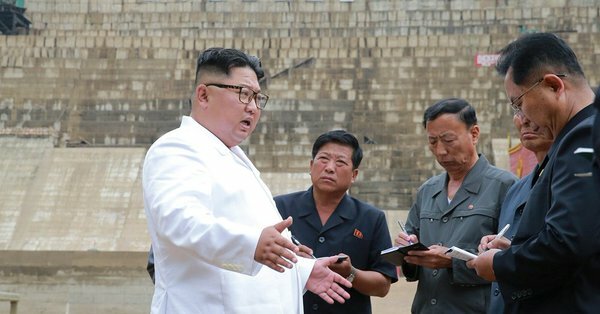 Kim’s response to the said plant visit was not the first time he lost his cool over his local officials and the progress of their projects in recent memory. During visits to two textile companies earlier this month, Kim also lashed out at officials for poor building maintenance, failing to modernize production lines, a lack of expertise and other problems. Kim’s latest show of domestic fury on economic matters, as he negotiates with the United States over abandoning his nuclear weapons programs, is being looked at by experts as a desire on the part of the once isolated leader to project himself as an economic reformer both at home and abroad. The North Korean leader promised his people when he took power in 2011 that he would build the country’s economy and improve the people’s living standards, alongside making his nation a nuclear power. Kim also appears eager for the international press to pick up his economic reform agenda or economic focus or mindset, as if to create a stronger impression that he’s no longer keen in pursuing greater nuclear power. Indeed, under his rule, the country’s economy has gradually improved with the expansion of some capitalist elements such as outdoor markets. But North Korea remains one of the poorest countries in the world and foreign experts say the tough U.N. sanctions imposed after its nuclear and missile tests last year could take a huge economic toll if they continue. After his historic meeting with President Donald Trump in Singapore in June, Kim has agreed to commit to "complete denuclearization of the Korean Peninsula.” The U.S. and its allies are still waiting for major progress in the North’s disarmament. Both the U.S. and South Korea also vowed to help the North revive its economy if it gives up its nuclear program. How about more food for his people? How about more respect for his people so they are not continually escaping to the south? Stop brutalizing them, they are not your f- slaves to use or to amuse yourself with. A leader who brutalizes, who enjoys watching them die in the most disgusting way isn't even human. A Reptile? Trump introduced him to a new world on Sentosa Island. And the world will be a better place because of it. He wants to transition into becoming a statesman.